We were still sitting at the dinner table, half-empty plates in front of us, when my husband asked our two teenagers, “What was Jesus’ first command…his first teaching?” The kids raced to get their Bibles and hunt for the answer. Gideon, a little breathless, gasped, “Repent!!!!”. We continued to discuss aspects of repentance and why that was our Savior’s first command. But I stayed stuck on repentance. The next morning, I looked at the first passage I could think of about repentance: Psalm 51 is David’s cry for mercy after his sin of adultery and murder. David uses three words to describe his condition: sin (a specific offense), iniquity (the effect of our sinful nature), and transgression (rebellion which seeks our own way in opposition to God’s way). David’s words display not only his desperation, but the ease and efficiency of repentance. Similarly, Isaiah 59 uses the same three words to name Israel’s offenses. It speaks of the effects of sin…darkness, blindness, weakness, oppression. Then, gloriously, Isaiah tells how the Lord was displeased that there was no justice; he was astonished that no one intervened for his people...so his own arm worked salvation. “The Redeemer will come to Zion, to those in Jacob who repent of their sins,” declares the Lord (Isaiah 59:20). In our dinner-table discussion, Anna Grace mentioned that repentance involves an acknowledgement of sin and is followed by a change in behavior, habit, direction. She was right. David spoke, For I know my transgressions, and my sin is always before me (Psalm 51:3). In Isaiah 59:12-13, God’s people confess: For our offenses are many in your sight, and our sins testify against us. Our offenses are ever with us, and we acknowledge our iniquities. 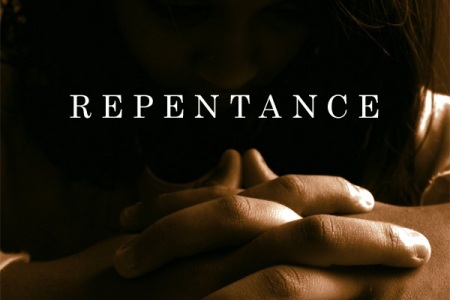 Proverbs 1:23 shares with us the benefits of repentance: Repent at my rebuke! Then I will pour out my thoughts to you, I will make known to you my teachings. Lord, make me hate my sin like you do and grant me the humility to repent.